“I am 8-years old. 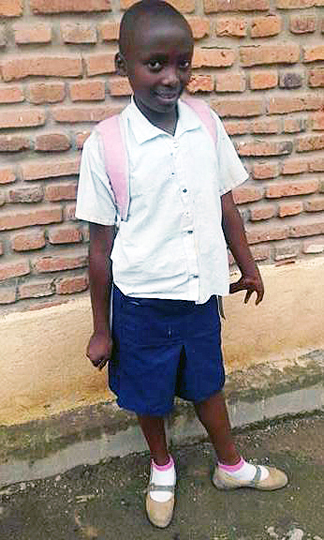 I was borne in Rwanda and I did my primary one school there. This 7-km away from where we live now (Bunagana, DR Congo). We chose this school because of minimal means, we do not have enough money to survive but we live one day at a time with our mother. My mother struggles to work and buy for us food, rent and other living expenses. 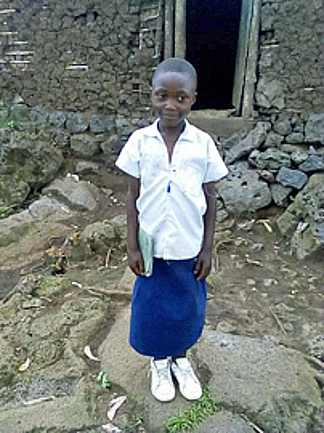 It is hard for her to raise our school fees and she has struggled to pay for our brother. I am the second child of a family of three children including two boys and one girl. My mom is called MUSHIMIYIMANA SUZANA, she was born in 1987 in Rwanda and married in 2004 in Ruhengeri RWANDA and became a widow since 2014. I have been an orphan of the father since 2014. After a difficult life, we have been displaced and in 2015 we moved to Bunagana, DRC to look for survival.